Why would one choose to go by MED Coach instead of flying? Transporting someone by MED Coach or by MED Flight is much simpler than trying to transport someone with medical needs on a commercial flight. When traveling on a commercial airliner there may be hassles with crowds, challenges with extra luggage, stress of deadlines to catch a flight, stress of going through security, cancelled flights, or waiting for hours inside the aircraft. Plus you may experience difficulty getting into a small and narrow seat. There is also no chance of lying flat, if the patient is not able to stay in a seated position for long periods. On our medical transports you travel in privacy and there are no embarrassing moments with catheters, tubes, wires, oxygen masks etc. You travel when you want to travel. In short we remove the stress. You ride in luxury, first class, and are treated with the highest quality of service and care. What is the advantage of going in a MED Coach versus a stretcher van or ambulance? Our customized MED Coach is designed to provide a higher quality of comfort and care for a long distance medical transport, unlike stretcher vans or ambulances, which are built for short distances. MED Coaches simply have better and more amenities than any other medical transport option. Clients can sit up in a 36″ wide hospital type bed with remote controls and watch the scenery out of a large bay window vs. looking out the back of an ambulance or van lying on a narrow stretcher. And the bed even has a therapeutic variable air flow cover on it to help prevent skin issues during transport. The on-board private bathroom is more comfortable and more accessible than getting out of an ambulance or van to use a public restroom and more private than using a bedside commode. However, if the patient has limited mobility our nurse can still assist you as well. There are even large flat screen TV’s, free WiFi, and a custom tablet filled with games and movies to enjoy during the journey. The luxurious differences continue with a microwave and refrigerator for hot and cold drinks, fresh foods, and snacks. We have room to have a relative ride along with you, which is not possible in the back of an ambulance. Most stretcher vans do not have room for a comfortable leather recliner seat with a footrest and a second bed that are in each MED Coach. 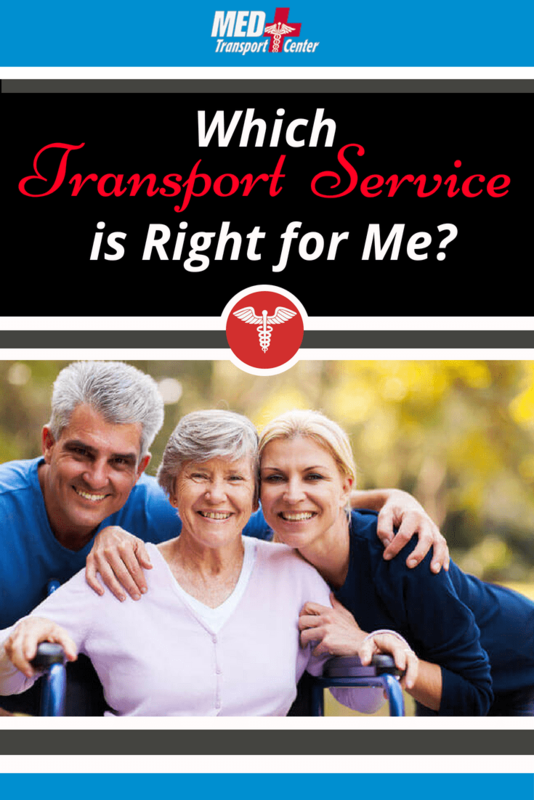 Why should I choose Med Transport Center over other companies? We have been transporting patients for more than 30 years and take pride in the outstanding quality of our service. For more details on each transport option visit the MED Coach and MED Flight pages of this site. How do I decide whether it is best to transport by ground or air? Give us a quick phone call .Our reservations team member will ask you a series of questions that will help determine the type of transport that is best for the person being transported. Do I need to coordinate the trip between the facilities? Transferring care and benefits from one state to another is very complicated and time consuming. We do all of the coordinating related to the transport to help lighten your load. We will contact each facility and request the information needed and work out times and dates too.